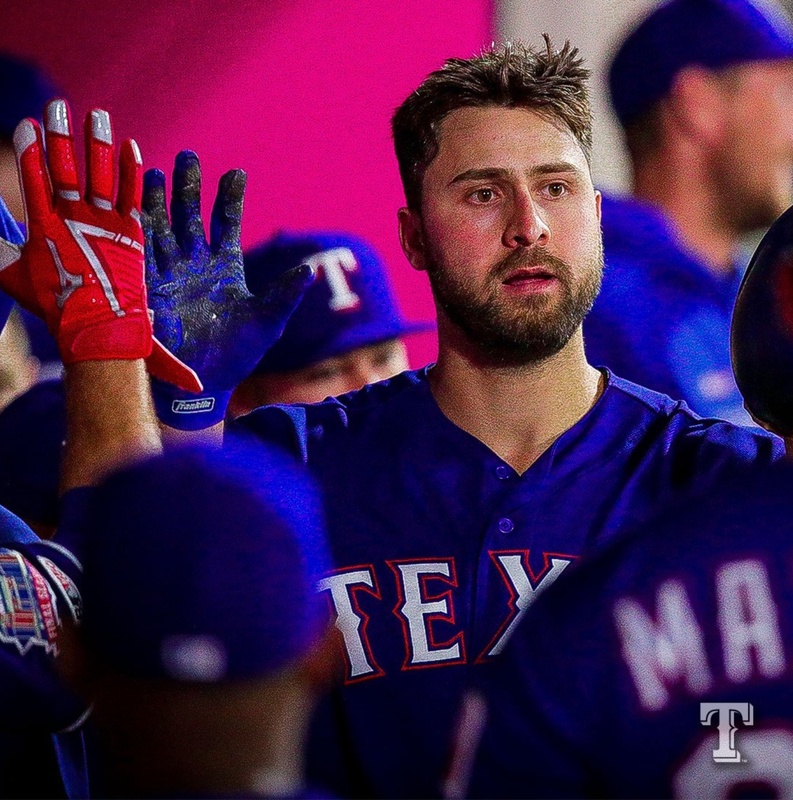 Home » Texas Rangers » One of these is not like the other. 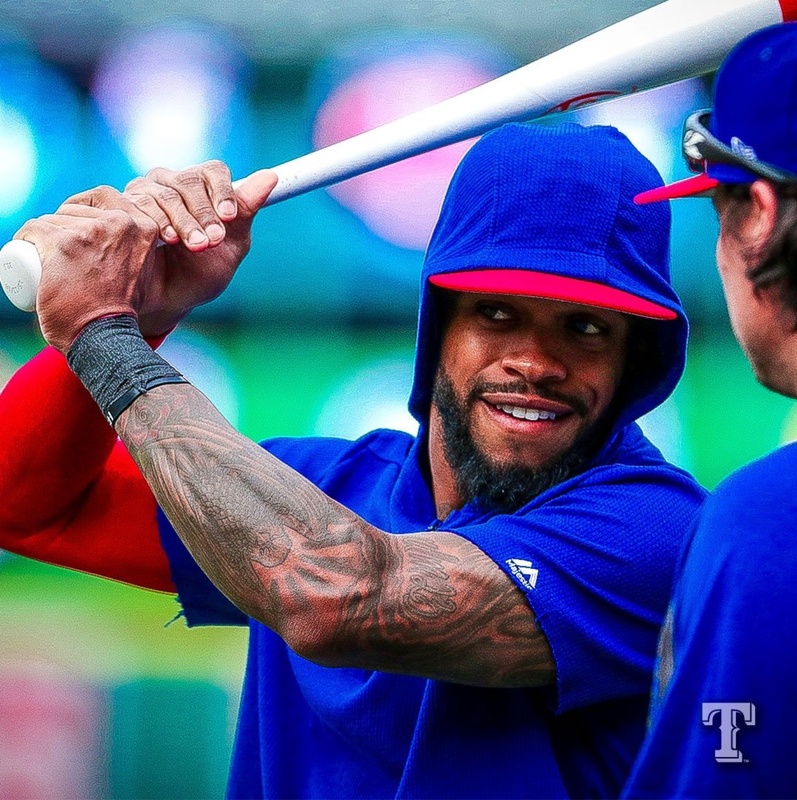 As a public service announcement to the Texas Rangers: This man is armed and dangerous. If you see him near a plate, use extreme caution. Do not throw any pitch right over the plate as Lance Lynn is about to do here. Remember that kid’s game, “One of These is Not Like the Other”? It was a page of objects and you had to circle which one was different. It’s usually not that difficult. Let’s try. One of these is not like the other. Can you spot it? If you circled Mike Trout, congratulations, you won. Also, if you circled Mike Trout, commiserations, you just ruined your computer screen. Look at that lineup. It has to be one of the most ineffectual lineups in major league baseball. Remember the old Yankees team that was dubbed Murderer’s Row? 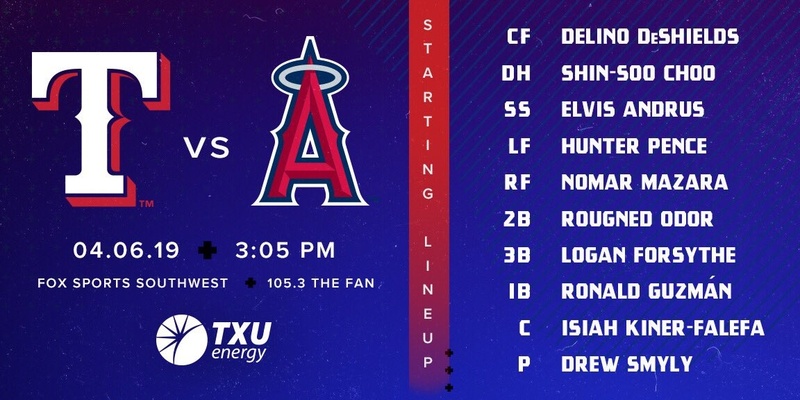 This Angels lineup is the Choir Boys Helping Old Ladies Cross The Street Row. Other than Mike Trout, there isn’t an run to be found. Which begs the question: why would anyone every throw a pitch that is within a two county vicinity of Mike Trout? Back in 2016, Bryce Harper, fresh off his one good season, his MVP year of 2015, and his Washington Nationals were coming into Wrigley for a four-game series in early May. Joe Maddon had a plan. He decided to walk Bryce Harper as often as he could. In the first three games of the series, Harper went to the plate twelve times. Over all, he was 1-for-4 with seven walks, one of which was intentionally intentional. The hit him once as well. He had one RBI, from a sac fly. Game Four of the series went thirteen innings. That meant Harper would come to the plate seven times. He was walked six of those. They hit him with a pitch the other time. “You know how good he is. Why tempt fate?” is what Joe Maddon said. The Cubs swept the four-gamer. They also won the World Series for the first time in over a thousand years that season as well. Harper went into that series batting .266. From that point on, he went into a major slump, ending the season batting .243. Maddon’s plan worked. Cut to yesterday. Of course, Harper is no Mike Trout. But, still. The Rangers decided to pitch to Mike Trout. He hit two over the wall. 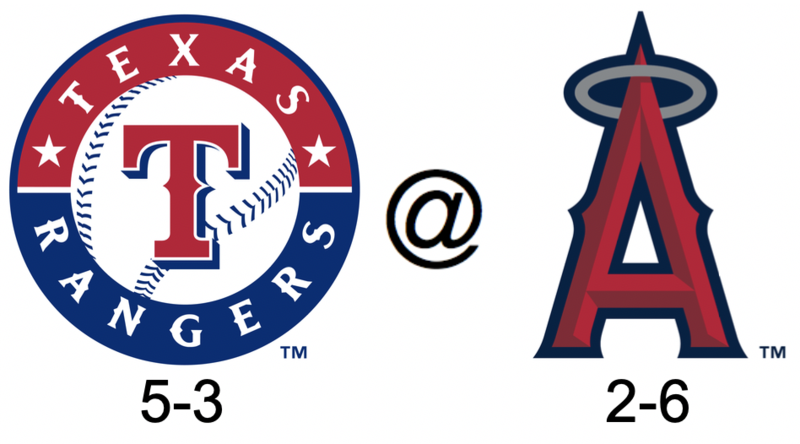 That’s all the Angels needed in their 3-1 victory over Texas. Because all the Rangers could muster was one over the wall. In a game that has devolved into a home run derby, the team that has the most Mike Trouts wins. The Angels have one. The Rangers, zero. Let one of the other’s beat you. Which, by the way, the Angels came into the game 1-6. So, none of those other guys were beating anyone. One thing I don’t want to hear from my players if I’m the manage is, Mike Trout beat us. That’s a defeatist thought. Fine if the fans want to say it, but I don’t want to hear it from my players because it’s not true. We beat our selves. We only scored one run. We’re supposed to lose. We had opportunities and didn’t capitalize. Either the opposing pitcher was really good or we were really bad. If it’s the latter we need to get better. Learn from our mistakes and don’t make excuses. Lynn pitched a great game but made a fatal mistake at an inopportune time. A tie game, he’s down 0 and 2 to Trout and grooves a pitch center/center and Trout did what he does with pitches like that. Parked it. In reality just about any player with a modicum of power, given that pitch in that count, would have done the same. Mistakes happen, learn from them and be more careful and minimize them as much as possible. Come back tomorrow and do better. You are right. One run generally is not gonna do it. Still, Trout was the catalyst for the loss, since he scored 1 more run than our team. I was encouraged by Lynn, but grooving one on an 0-2 is stupid. As you say, it doesn’t take a Trout to do something with that. I want to see them take, or split, this series. Take, preferably. So, need a win this afternoon. Technically Trout scored both of the runs over the 1. But that’s exactly how baseball people think. “Don’t let that guy beat us.” Which is why, in the story above, Joe Maddon walked Bryce Harper thirteen times in four games. And why he said, “Why tempt fate?” It’s why teams walked Barry Bonds all the time, sometimes with bases loaded. You don’t let the guy beat you. The problem with that is, in this case Trout didn’t beat the Rangers. They beat themselves by only scoring one run. They had opportunities and failed to capitalize. Giving Trout all the credit just avoids the issue of failing to capitalize on scoring opportunities. Had the walked Trout every time he came to the plate they’d have probably still lost. Visiting teams usually do lose tie games in the bottom of the 9th or in extra innings. It’s fine if the fans want to do it, but I don’t want to hear it from the players. It just breeds more of the same. Sometime Baseball is a war or attrition. While the Rangers weren’t capitalizing on their opportunities. Neither were the Angels. 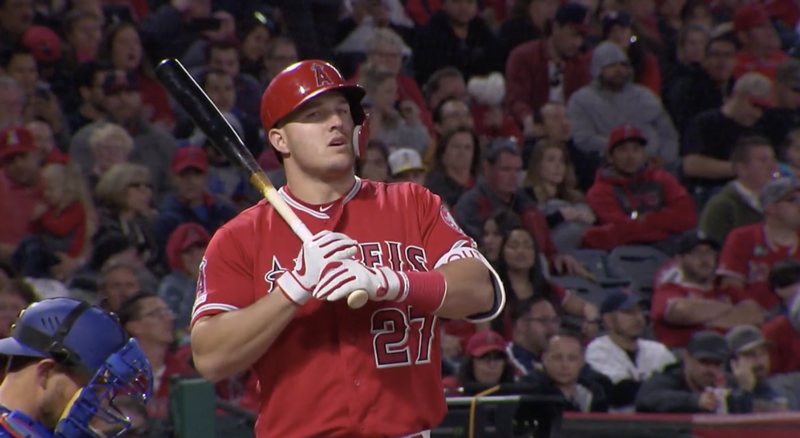 I’m sure the players may not be saying(and you don’t want them to say) Mike Trout scored 2 of 3 runs but the reality is Mike Trout single-handedly scored 2 of 3 runs all while the batter below him in the lineup isn’t currently hitting the broadside of a barn. If they want to put Pujols(or someone else) behind Trout to protect him then we should be making them do that. Otherwise you have to go the attrition route. I hear you on that. They had every opportunity to win it on their own. Of course, we don’t want our players using Trout as an excuse for their own shortcomings, but then again, we don’t want our games handed out on a silver platter by ignoring a factor like Trout or treating him like he’s just another player. Besides it’s not an either/or situation. We play these teams as they have been constituted by the opposing GM/FO/Manager. We do ourselves a great disservice by ignoring obvious ways to give ourselves a strategic advantage, which in the case of the Loser Angeles Angels is failing to walk their one and only threat at the plate as a matter or course. This injury to Volquez reeks of being longer than it will be shorter. And with the injury history of Smyly and Miller, I wouldn’t be surprised if one or both of them come down with arm problems as well. Yes, and what worries me is the FO panicking and rushing some of the young arms. Sampson can start and there’s Jurado, but after that, I suppose there’s some cannon fodder at Nash that they could bring up. I don’t want Jurado anywhere near a ML Roster, or at least a Rangers ML Roster, if some other team wants to make a trade we can talk. Every time they place players(especially pitchers) on the List(whatever you want to call it) after a bad start I get suspicious that they are trying to work out mechanics or just trying to keep someone from being released. I know probably just paranoia at work and when you sign a bunch of “refurbished” pitchers you should just expect them to break again. Volquez has never been that great anyway. Around a 4.00 career ERA with about 4 walks for game doesn’t bode well to me for him becoming a solid starter. I wonder if they moved him to long relief, that might suit him better for now? Career 93-87 for mostly subpar teams and a no hitter……not great like you say but serviceable. Why not a CYA winner? Keuchel is there. Price has to be down. Could be a solid starter. I can’t believe my own eyes, but the Rangers seem to be growing pitchers on the farm. 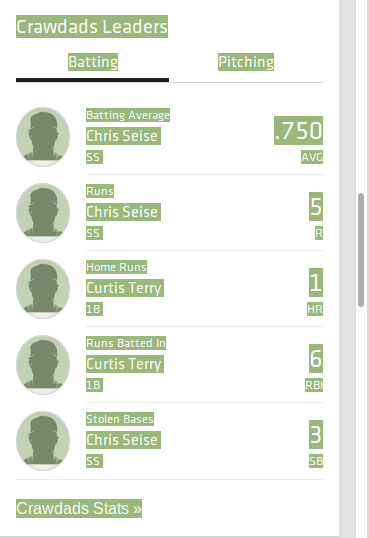 In case any of y’all missed it, Chris Seise is making a mockery of A- baseball. Kevin, I have a great idea: don’t pitch to Trout. He can hurt you. No one else in El Lay’s lineups likely to do much, although it COULD happen. Take your chances with them. Not with Trout. Is that original or what? Thanks for giving me the link to sports reference(again) and to others who also responded to my query. Well, we can’t win ’em all. Can’t have all but Odor hit every night. But, Lynn was very encouraging, even if he faced a bunch of ninnies. It’s still a well-pitched game(other than “see above”) against MLB players. The rotation will have to help out if this team is to contend. That does not mean that JD can’t sign Kuechel. No one has bitten, so his price has to have dropped. I’d sign him to a contract like Lynn’s. He is worth the risk. Minor looked great last time out. I think 1 other starter has pitched well, not sure. Whatever–better SP is needed, or so it looks. 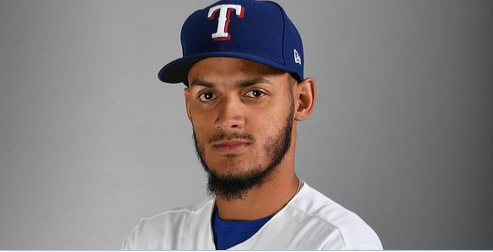 I not worried about Odor, but would like to see him START the season. And he had a great ST. You were right. ST stats don’t mean squat–mostly. Rest of the lineup needs to stay the course. I expected it out of Arias, but not Leody. He hasn’t hit, ever. Looks like he may have turned the corner and is earning his ranking as a top five prospect. Maybe repeating a level is all he needed to wake up. If so the race to take DD’s job is heating up. Greg Ellis…..6th grade sponsored ball…..was our pitcher no one could hit him. We played for the Championship. It’s amazing how some thing that doesn’t really matter in the big picture gets stuck in our brain and we just can’t shake it off. Lord knows I’ve got some of the same issues. Ha, those are the great moments, though. You should remember them. Sometimes you can get an idea of what the big club has in mind by looking at changes to the minor league depth chart. In this case Nash’s pitcing depth chart. Sampson has been removed and Jurado has been moved up to the number two spot. An indication that Sampson is going to stay with the big club? Wait! We got rid of Kirkman 2.0? Yippee! Look at that Angels LineUp. Can you explain me how the hell Chavez blew the game last night? Please JD ….. release Chavez. Sure, he grooved a pitch when he shouldn’t have. Why? Probably didn’t go where he wanted it to go. Gonna have to do better. I wonder if the pitchers let facing Trout get in their head. Lynn did the same thing. Grooved and center/center pitch on a 2/0 count. He’d been pretty much spot on all night, then that. Kev, Eric Nadel made that very same point last night about NOT pitching to Mike Trout. 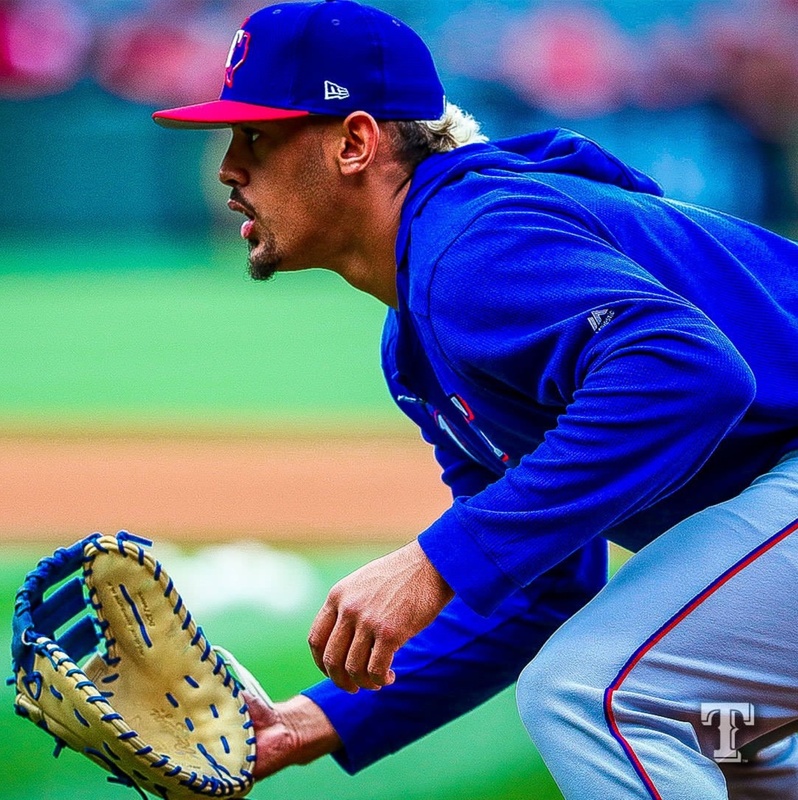 On another not so positive note, (and am sure this comment will not be very popular with some here) but Odor seriously needs to start contributing to this team on the offensive side of the game, and soon. So far, he is hitting 194, with ONE whole RBI, no home runs and 11 strike outs. Yes he is playing good defense, even outstanding defense, might be the better term for it. But that alone isn’t going to “cut the mustard”. 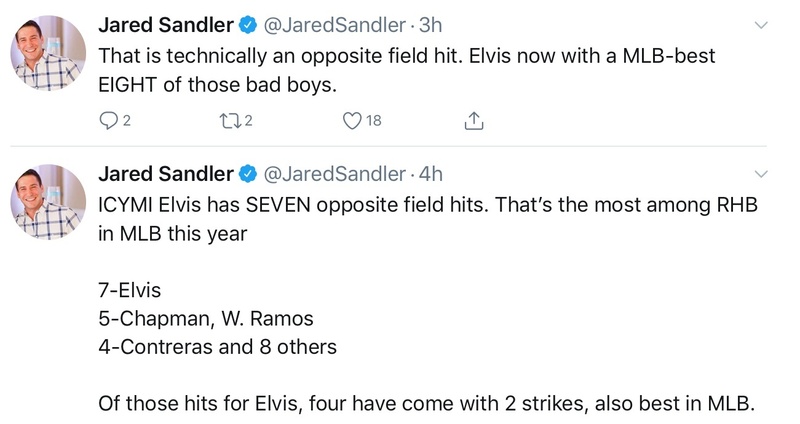 In the spring, we kept hearing about how Odor had remade his approach at the plate, and how he was going to be more selective at the plate this season, yadda, yadda, yadda, But 11 strike outs and two walks so far, doesn’t speak well of this theory. Neither does it sound like it is going to happen, when Eric Nadel keeps saying “…and Roogie just chased another very bad pitch, high and way out of the strike zone”. Yes, Roogie shows brief flashes of offensive prowess, followed by long stretches of near total ineptness. Even last night earlier in the game, Eric Nadel was very complementary of how Odor appeared to be more selective, and how he had hit a double, and had scorched an out to 2nd base. But that did not last even last though that one game, as we saw him striking out, and then after the 4th inning I kept hearing the same “chase call” by Nadel. So like Nadel last night, we all keep hoping and waiting. Then when Roogie finally comes through, and he does have a good game or two, or even a good at bat or two in succession, we keep thinking “This is it!”. But it never is. So when is it going to finally happen? I am beginning to think it will never really happen. Because like most big league players usually do, Roogie has established a pattern. So maybe he is what he is, and we will just have to be satisfied with that idea. But I sure hope I ma wrong about that. I am a bit concerned, but your point is well taken. Odor is going to be a star player. The fact that he’s playing great D while struggling at the plate shows pro maturity. I am confident that he will be over .900 OPS before long–and stay there. I like the way you think. Probably because I tend to agree. A couple years ago, I would have disagreed. But last year he seemed to finally drop his stubbornness and realize he had to improve. And this spring he did some really nice things. He seems to have turned the corner. Let’s hope so. 3 years, not 8 games. Sure ’nuff. But you missed the point. Roogie was supposed to come out of spring being more selective and more productive, etc. There was much talk about this very thing. But where are the results? That is my point, plus the “groundhog day” effect of how this keeps repeating it’s self. I hope Woody is taking notes and different from Banni, moves him to the bottom of the lineup if he doesn’t start performing soon. Odor seems to be a better hitter at the bottom of the order for some reason. Looks like he heard you . . . Odor is 6th but I was thinking more like 8th or 9th is where he should be right now. A wee bit on the smelly side, methinks. Could be, I’m a wait and see guy in almost all cases. I’m just throwing the numbers up. More for something to do on a rainy day than anything else. At least today’s game is an early afternoon game so there will be something to do this rainy day. A couple years ago, Pudge said that someday Odor was going to be close to a .300 hitter. Ed says that it’s entirely possible given his attitude and skill set. Yes, it’s still and always possible. But with each passing season it has to become more questionable, doesn’t it? When does potential begin to look more and more like wishful thinking? Calhoun is driving me bonkers with the good/bad stuff. How you evaluate that I have no idea. I guess you just say it’s a young season and hope the picture clears. Took me a moment to realize you were talking about our Calhoun and you weren’t talking about Kole. Yeah, I see now I should have been more explicit. For those wondering about Keuchel, here’s the catch. If they were to sign him before the draft, it would cost the Rangers their 2nd highest pick and $500K of International slot money. And they would have their best pitcher for the next x-number of years. I wonder what’s scaring everybody off? His price, or something else. Teams can always use a quality starting pitcher. You’d think somebody would have signed him by now. I am thinking the same thing. He must be stubborn about his asking price. Or, maybe he has decided, screw it, now I can sit back and wait for desperation to sit in. The Red Sox and Cubs are both off to horrible starts. Will either panic? What’s worse for your health, two pots of coffee or a six pack of beer? I don’t know, don’t care, and fixin’ to throw caution to the wind. Just finished the second pot of coffee and fixin’ to start on the six pack. I’m so brave. I’m no doctor,but I believe they cancel each other out. So if it’s not bad then it must be good, right? Coffee and beer are two staples of Navy life. Coffee at sea and beer in port and lots of both. At one time the Navy was so picky about their coffee they had their own buyers and own coffee roasting plants. I don’t know what they do now, but the plants have been closed and they used some form of commercial coffee. They buy it in 20 lb tins. One thing I do know is you never, never, ever, ever, wash a coffee cup or coffee urn. Leave them as is. Why don’t you wash them? Believe it or not, the coffee doesn’t taste the same out of a clean pot or cup. Which is better? I’ve got a cup that has a quarter inch of scuz in it. I think it has more with tradition than anything else. An article that is a lot more true than false. What else is there to do but walk away knowing you had a decent career? Yup! He’s got it figured. Sad. You hate to see any player face the end like that. But from the undertones of the article in today’s paper, it’s looking that way. At least he’s got a game plan. The medical bug has a way of grabbing some of us at an earlier point in our lives that we expected. It helps to have a good landing spot. Some advice from a guy that’s been there to people that probably won’t take it. Have a plan, it doesn’t matter what it is, have one because if it happens you probably won’t have any warning. I was lucky, I was on active duty so had plenty of time to get things straight and all the medical stuff was taken care of. That’s something most people don’t have. You aren’t bullet proof so the bug can bite you. Have a plan. Why on earth would we ever, ever, EVER pitch to Trout? Just walk him automatically. Every single time. There’s no shame in it. The Angels decided to field a one-man team, so that’s all we need to know to beat them. WALK TROUT. Kevin, is this you? Did you change your handle? Emmanuel Clase, a RHP who throws 100 with cut, pitched a perfect inning with 2 Ks. He’s special. He’s in High A, skipped low A.
That’s great. We’ve had enough of our own pockets being picked. Time for karma to come through! In case nobody’s figured it out yet, I’m really stoked about the young arms in the Rangers system. He should be, he traded for some of them. Had a lot of help/advice, but he was the man in charge. Oh, in case anyone wondered, I changed my avatar and handle to RR3. Why? I don’t know. New regime with the Rangers. New process. It was time for a change. Yeah, I guess I should have said something. I just realized after you posted below not everyone would know what was happening. But then, when you saw the same stupid inane dribble that you used to see from dearmidol, you would figure it out. There can’t be two idiots like that. I meant to do it before the season but when I came back from Iceland I forgot. I like it. It’s distinctive. I should have remembered when I changed my picture a few years ago it took a couple of hours for the change to show up. “Invasion of the Mod-y Snatchers” ? You were right. It was Kevin! I don’t like to use this space to self-promote but since this is a baseball blog, this is appropriate. I was fortunate enough to have been hired to write GEICO commercials supporting their partnership with MLB. We did five. Here is the first one. I’ll post the others when they air. Do you remember they dug up a portion of the new Yankee Stadium a couple years ago when they found out one of the workers buried a David Ortiz jersey underneath? Heck, self promote away. I like Geico commercials. Actually I think Commercials are some of the most intelligent stuff on TV. Thanks. I can’t wait until the others run. I’ll share them when they do. Nice day for BB…..Lone Star double header….TX then Stros at 6……Brats and grilled onions, dill potato salad…..and stole beer from ED…..SHHHHHHHHHHHHH don’t tell him!! Stolen beer always tastes the best. Kevin on a new account? Or Twig? Kevin changed his posting name. This is Kevin. I changed my avatar. Money unearned is twice as sweet…. Fake news …. nobody steals Ed’s beer. To do that they have to get past the live in Chinese Chef/maid/masseuse and she never sleeps. Let’s see if Pence knows what to do with RISP. You sound like Dave Raymond. He hit it at a player, but he says he hit it hard as if that will make me feel better that it’s just another out. Time for a minor league rolled inning. That was a pucker moment. It’s innings like that that give me a yearning for mojo. It’s great that major league players don’t know how to hit anymore. Rangers are going to need to start offering a prize to the first of the TJS(Tommy John Squad) 3 to reach 5 innings pitched in a game. That should have been ball four. Hickory is ahead of Lakewood 2 to zip in the third. These innings are soooooo long. Smuyly’s going to hit his pitch count before long. As long as he doesn’t give up runs I’m okay with it. I don’t feel well about the way this is going. Good thing the Angels can go only one base at a time. If I were in the Philippines I’d be drinking Mojo instead of beer. This is sick. we’re trying to lull Skaggs into a false sense of security. Sampson might be in the rotation now. Very well could be. Either him or Jurado. I don’t have good vibes about Edinson (never could spell his name). Whenever Volquez’s turn comes up. Yeah, it said in the paper today, Sampson might be available today, because of those off days. Good Grief. Talk about breaks!!! Looks like he’s inherited Beltre Leg Syndrome. I doubt they do this, but if Guzman is out for a while, I’d move Gallo to 1st. I don’t mean for this game, I mean while he’s out. Gallo isn’t the greatest in the outfield. Give Pence more playing time. That makes sense. I forgot about him. Yeah, but it’s too early to bring him up. If you haven’t been paying attention he’s been pretty much stinking it up in Nash. Give him some time to get his stuff together. That’s after the next injury. Walk Trout or… hit him. That works. Bah . . . stolen base. Dave just said Gallo made the catch in left. The only thing I can say is he’s a little better than … two for the price of one who’s name escapes me at the moment. Give me a half hour and i’ll figure it out. Time to go to Sampson for the 4th inning……. why wait? Volquez to IL who will start for him? This is like watching two wounded ducks trying to swim. Call from downstairs for family game time. The women want to hustle me in Yahtzee. I am leaving my wallet upstairs. talk to you all later. Good luck, but I’m not optimistic. At least Hickory’s up 6/1 in the bottom of the 6th. Sadzeck is pitching right now. Got 3 outs but he was pitching with a 9-2 lead. Might be his last batter. Bases loaded for Trout. Nice. Now is the time you walk him. One run is better than four. Now what. Bases loaded and Trout is up? This is the stupidest thing I’ve seen in ages. Why????????? Smyly was out of gas. Out of gas? Full of gas? Why pitch to him? EVER? Walking him is no different than any other metric you use to increase your chances of winning. It’s totally illogical, completely bonkers to go toe-to-toe with a player who can beat you with one swing. If you’re too big a man to walk him, if you think it somehow weakens you to admit he can beat your whole team, then why is it OK to use other stats? Why isn’t defensive shifting admitting you’re too weak to beat the hitter straight up? Why study a hitter’s spread pattern? Why scout the opposition? Winning is finding and exploiting an advantage. SO WALK HIM. I totally agree. Never pitch to him. No. Losing is thinking like a Banister, like it’s more manly to go head to head with Trout with a worn out pitcher and bases loaded. Losing is letting a team like the Angels beat you by surrounding Trout with a whole roster of minnows, because they bet you’re too big an ego to admit you can’t beat him. If Trout was part of a strong lineup, if skipping Trout just meant you had to face a slightly less frightening alternative, then fine, pitch to him and take your chances. But nobody forced LA to field a team of weaklings surrounding Trout. They shouldn’t be rewarded for it. And we shouldn’t be giving away games for nothing but the bragging rights that we faced Trout… and lost. There’s a time to walk him and a time to pitch to him. this was a walk to him. I’m tired of the retreads. The Challenge did the team in. Mike Trout might be the one player who is underpaid. Well it’s about time for reality to set it. Walk Trout give up 1 maybe get that same pitch again and get a double play. Crawdads are up by 7 bottom of the 6th. I like minor league baseball. With this rotation, the Rangers would have to score six runs a game to stay over .500. 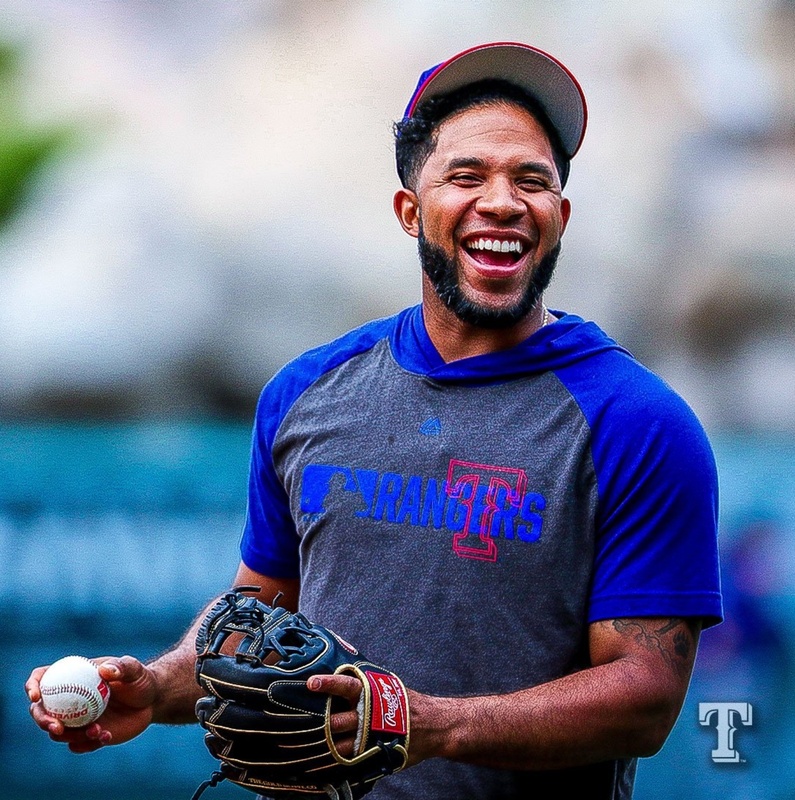 Ronald Guzman leaves Rangers game with hamstring injury. Could it open path for Willie Calhoun to join big league team? If it does, it certainly won’t improve the Rangers chances. 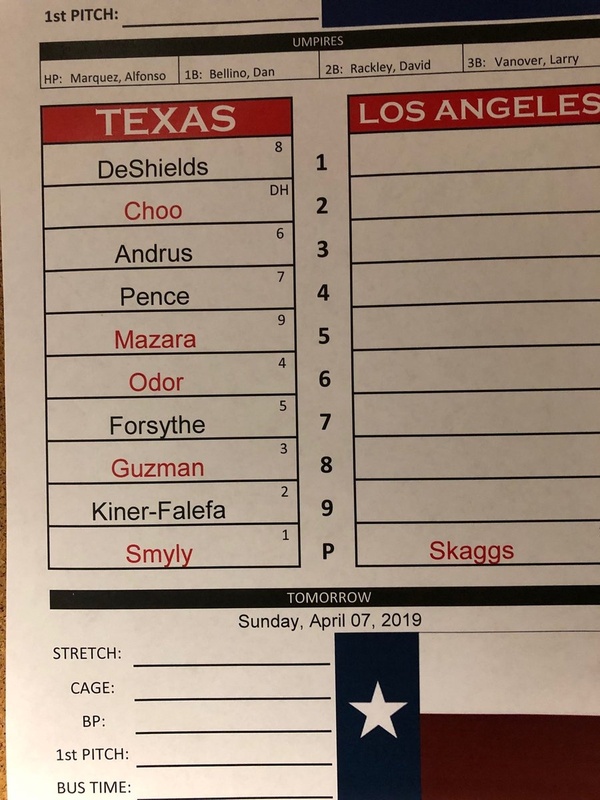 That would, if I am reading it correctly, involve moving Gallo to 1st and playing Calhoun in LF. Putting a fence post at first and leaving Gallo in LF would be better. Nadel is saying most likely Wisdom…..but IMO we have to find out about Calhoun…. I don’t know. Looking at Nash stats it’s a toss up between Wisdom and Davidson. My thinking is they want Davidson to work on being a hitter, so that leaves Wisdom. Just a guess. When are people going to learn, Calhoun’s route to the big leagues is as a DH and back up LF. He can’t play RF, CF or 2nd base. He’ll go as far as his bat will take him. Anything else and he’s a negative. I’m sorry, but he is what he is. He is anchored to LF and DH. That’s it. And nothing. He is what he is, a potentially big bat and less than optimum fielder. Hope they’ve learned to lesson, don’t pitch to Trout. 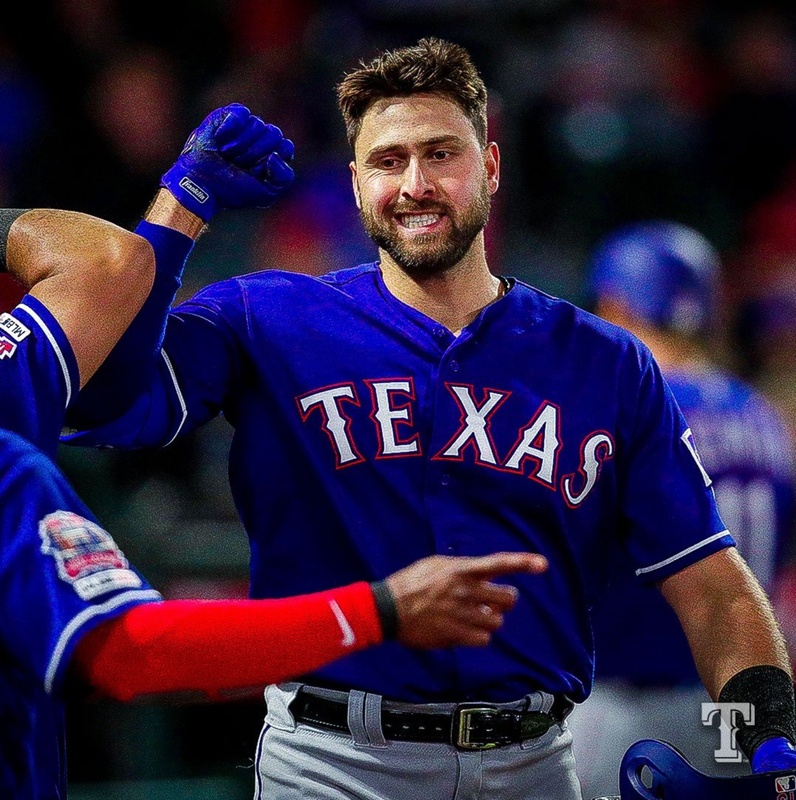 Can we go back to the Rangers team that scored double digits in game? They were more fun to watch than these guys. I’m afraid what we are going to have to live with is a mixture of the two. Sometimes one, sometimes the other. Half and half is better than all bad. is it all over? I Just woke up and checked score on mlb.com. They were braggn’ ’bout Trout’s monster grand slam. 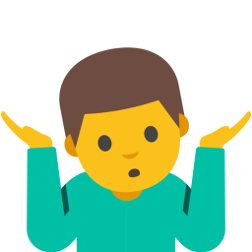 Why did they pitch to the ^^*&Y*T*? Six up six down since that grand slam. It’s only 4-1. So, yes. need to score against this “bad” pitching team. Sure can. I’ve seen a lot worse. I remember the Padres being up by ten runs in the bottom of the ninth and the Dodgers walked it off. Yes, it’s certainly within reach. And we’ve seen this team come back already a few times this year. 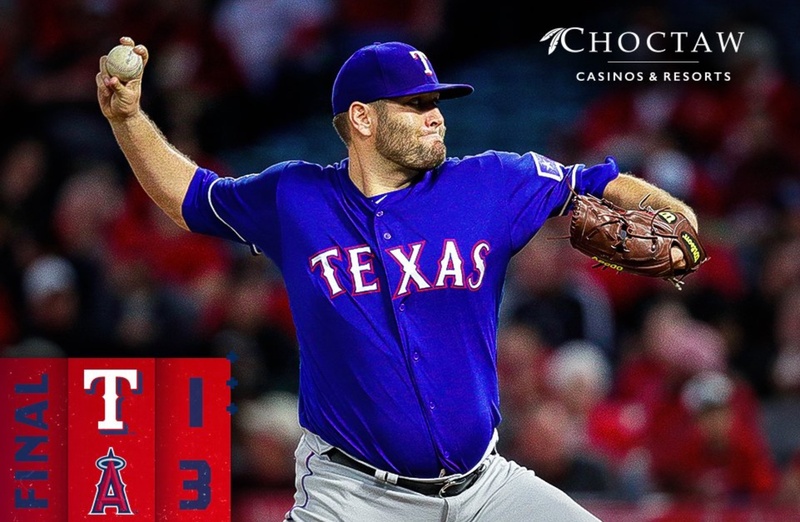 Stay tuned we have to see if the Rangers can score more than 1 run. Should have tried to pitch around him. Instead, threw a meat ball. They walked Trout that time. And it didn’t hurt. Too bad the damage was done. I’ve already won. The live in Chinese chef/maid/masseuse just brought be a big plate of sweet and sour pork, a big bowl of rice, and a bowl of been sprouts. Life is good. Well, I guess we might as well include Pujols in the fun. No since leaving him out. Hickory beat Lakewood 9 to 1 so there’s good news. DeShields needs to start hitting. Yup, but we’ve been down that road before. Alexy gave up two runs in the first, but has settled down and shut them down until now (top of the 4th). DownEast is losing 2 to 1. Alexy must be ready for a call up to the Rangers, he only went 4 before being pulled. Oh, well. We can even the series against Trout tomorrow. Three Ks to end it. Come on, Rangers. We need that offense back. Really a bummer, even my minor league feed has gone south. Reed has been up for a half hour. Sometimes life isn’t fair. I’m watching the second half of the Auburn game first. The Intentional fouling I think did them in. Oh man. I am going to hate to see them rush the young starters into MLB action. Not fair that they don’t get to develop all their pitches before being thrown into the fire. I bet we see Hearn here before the break. Maybe there is hope for Smyly and Miller, but I think we might be looking at “Moore 2018” numbers.